Finally! Find out why some people almost always succeed. "Who Else Wants To Stop Living A So-So Life Where Nothing Seems To Change?" Live A Life You Can Be Proud Of, Step By Step, And One Goal At A Time! Absolutely nothing, I say. Nothing is impossible. We all heard in school over and over again, "You can do anything you put your mind to?" So many people, maybe you, but certainly me... ...so many people only did with that line what we do with most great advice at a young age. Nothing. We heard it, but we didn't listen to it. Listen, somebody has to be President. Somebody has to be CEO of the company. Somebody has to graduate at the top of the class. Why can't it be you? Millions of people eat healthy every day. Millions of people live their lives debt free. Millions of people go back to school. Why can't you? Chances are, the only thing keeping you from reaching your goals... ...is you! A time comes in every person's life when they need to sit down and really think about their goals. Every person dreams. But not everyone can come up with a plan to realistically set out after their dreams. Those people just need a little help. Some good solid advice. Advice that you can find today within... ...Your Guide To Setting Goals Successfully! Greetings Friend, Give me 20 minutes and I'll change the way you view the rest of your life. No matter what it is you wish to do. Be it learn to be a better cook or run in your first marathon. Any man or woman who ever set out to do such a thing first made it a goal. The feeling a person gets after just climbing Mt. Everest is the direct result of them knowing how to take steps towards reaching their dream. That knowledge got them there. How long has it been since you got that feeling of accomplishment? What are your dreams? Your aspirations? What in this world do you want to do before it's too late? And what did you do today to get you closer to that goal? (If you haven't done anything yet, it's not too late. I'll tell you more in just a bit.) If you want to change your life forever, you'll master the ability to set a goal - then reach out and grab it. If you can learn how to successfully reach your goals - nothing in this world can stop you. See How Easily You Can Reach The Life You Always Dreamed! Deciding in one moment to get out of debt can seem very overwhelming. Taking the first step towards starting your own business can seem like your jogging the first lap of the Indianapolis 500. But what successful people know that others don't... ...is that it you meet your goals by tackling them realistically, step by step, and with confidence. My 50 page report, "Your Guide To Setting Goals Successfully," tells you how to do just that. This thoroughly researched guide can be downloaded straight to your computer. And it's packed with goal setting know-how. In fact... Here is just SOME of the information you will find inside: => The one technique that is used by professional athletes, successful business people, and high achievers in all fields. (Page 5) => 9 areas of your life you need to prioritize NOW if you want to be successful with lifetime goal setting. 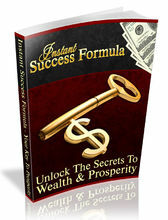 (Pages 6-7) => How to avoid sabotaging your own success. (Page 7) => An easy way to plan your lifetime goals to make sure you're not left with any failed wishes. (Page 7) => Small ways that you can prepare today for goals 20 years away. (Page 8) => What NEVER to include when writing down your goals. Do otherwise at your own risk! (Page 9) => What successful goal setters do when they plan for results. (Page 10) => 4 ways to take a close look at goals you've achieved for maximum benefit. 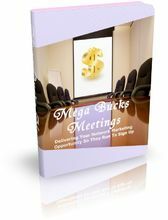 (Page 11) => 5 crucial methods for questioning your goals to make sure they truly match up to what you desire. (Page 12) => How thinking too much of others can actually be a bad thing. (Page 12) => How too much goal setting can leave you with the wrong results - and when to say enough is enough. (Page 14) => The secrets of Quantum Leaps, and I'm not talking about the TV show. (Page 15) => The one thing that is probably holding you back the most. (Page 16) => The little known struggles even successful people go through when achieving their goals. Know that you are not alone. (Page 17) => 10 questions to ask yourself when considering your career goals. (Pages 17-18) => The "Who, What, Where, When, and How" method to choosing your career path - this little exercise could change your life. (Page 19) => The "5 steps" John is going to take over the next three months to put him into a position to be company president in 10 years. (Pages 20-21) => 4 strategies to use when setting up your bullet-proof action plan. (Page 22) => The secret value in planning your life backwards. (Page 23) => 4 active ways to make sure you follow through on your goals. (Page 24) => The little known fact that even the most fit people around us don't always work out 7 days a week - and you shouldn't set goals that tell you to do so! (Page 25) => 12 questions to ask yourself when planning realistic exercise goals. 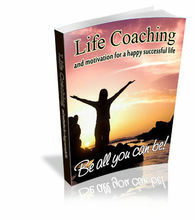 (Page 26) => 35 goal setting questions that will help you discover happiness in relationships. (Pages 28-30) => What successful people know about the saying, "Most people don't plan to fail; they just fail to plan," that you don't! (Page 31) => 4 simple as kindergarten steps to financial success. (Pages 31-32) => 7 tips to start doing today to secure your financial future. (Pages 33-34) => Why people who set goals also know how to help set goals for their children - like getting better grades. (Page 35) => The little known goal-setting system that seems to work for everyone who's tried it. (Pages 35-37) => 10 questions to ask yourself when planning your artistic goals. (Pages 38-39) => The one element that will make sure you stay motivated. (Page 39) => 20 ways to keep yourself motivated long term. (Pages 39-40) => 10 practical "Do's and Dont's" for setting goals that can change your life. (Page 41) => Why "time management" really is a falsity! (Page 42) => 15 "time-stealers" to be aware of and to watch out for! 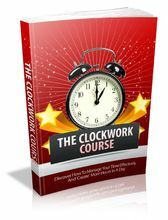 (Pages 42-43) => 9 hazardous time management issues and how to effectively deal with them once and for all. (Pages 43-45) => 4 ways to maximize your use of time for total efficiency. (Pages 45-46) => 6 symptoms of stress that may be telling you you're doing too much. (Page 47) => 5 steps to managing stress like a superstar. (Pages 47-49) And there's MUCH more - guaranteed! Get "Your Guide To Setting Goals Successfully!" Today - Risk Free! If You Don't Start Taking Chances Today, You'll Hate Yourself Later! The worst thing that can happen is that you wake up in ten years and realized you missed a great opportunity. No matter what you want to do. Write a novel. Change your diet. Get better grades. Take up a new hobby. Run for office. Learn another language. Do some spring cleaning. Or whatever your heart desires. It all starts with taking the first step. And that step is on page 5 of my report. But my guide won't teach you how to just reach your goal of losing 15 pounds. It'll teach you, step by step, how to completely change the way you live your life. Starting with life time goals, and starting with page 6, I'll show you how successful people start planning their life 50 years in advance. Can you imagine? Where do you want to be in 25 years? 10 years? Next month? When you dig through my guide, you'll find the value of planning your life backwards. (I explain what I mean on page 23) Successful people are dreamers. They envision what their life will be like in 25 years. But then they take steps today to make sure it happens. "Your Guide To Setting Goals Successfully" will take you by the hand and have you setting goals for 25 years from now. And help you figure out what you can do tomorrow to start putting yourself into a position to make your dream become a reality. "All men dream: but not equally. "Those who dream by night in the dusty recesses of their minds wake in the day to find that it was vanity: "but the dreamers of the day are dangerous men, for they may act their dream with open eyes to make it possible." T.E. Lawrence (Lawrence of Arabia) Seven Pillars of Wisdom You can change your life today! Remember I asked you before what you had done today to bring yourself closer to your goals for tomorrow? If you can't think of anything, than decide right now that reading this letter from me was your first step. Make the decision to take the advice in my guide forward with you through life. For $17.77, you can revolutionize the way you think about your future. What you invest today, you will see the rewards years from now. Months from now. And even weeks from now. Finally! Find out why some people almost always succeed. "Who Else Wants To Stop Living A So-So Life Where Nothing Seems To Change?" Live A Life You Can Be Proud Of, Step By Step, And One Goal At A Time! ...so many people only did with that line what we do with most great advice at a young age. Nothing. We heard it, but we didn't listen to it. Listen, somebody has to be President. Somebody has to be CEO of the company. Somebody has to graduate at the top of the class. Why can't it be you? Millions of people eat healthy every day. Millions of people live their lives debt free. Millions of people go back to school. A time comes in every person's life when they need to sit down and really think about their goals. Every person dreams. But not everyone can come up with a plan to realistically set out after their dreams. ...Your Guide To Setting Goals Successfully! Give me 20 minutes and I'll change the way you view the rest of your life. No matter what it is you wish to do. Be it learn to be a better cook or run in your first marathon. Any man or woman who ever set out to do such a thing first made it a goal. The feeling a person gets after just climbing Mt. Everest is the direct result of them knowing how to take steps towards reaching their dream. That knowledge got them there. How long has it been since you got that feeling of accomplishment? What are your dreams? Your aspirations? What in this world do you want to do before it's too late? If you want to change your life forever, you'll master the ability to set a goal - then reach out and grab it. If you can learn how to successfully reach your goals - nothing in this world can stop you. Deciding in one moment to get out of debt can seem very overwhelming. Taking the first step towards starting your own business can seem like your jogging the first lap of the Indianapolis 500. ...is that it you meet your goals by tackling them realistically, step by step, and with confidence. Get "Your Guide To Setting Goals Successfully!" Today - Risk Free! The worst thing that can happen is that you wake up in ten years and realized you missed a great opportunity. No matter what you want to do. Write a novel. Change your diet. Get better grades. Take up a new hobby. Run for office. Learn another language. Do some spring cleaning. Or whatever your heart desires. It all starts with taking the first step. And that step is on page 5 of my report. But my guide won't teach you how to just reach your goal of losing 15 pounds. It'll teach you, step by step, how to completely change the way you live your life. Starting with life time goals, and starting with page 6, I'll show you how successful people start planning their life 50 years in advance. Can you imagine? Where do you want to be in 25 years? 10 years? Next month? When you dig through my guide, you'll find the value of planning your life backwards. (I explain what I mean on page 23) Successful people are dreamers. They envision what their life will be like in 25 years. But then they take steps today to make sure it happens. 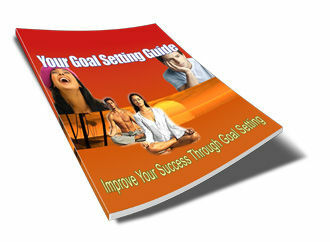 "Your Guide To Setting Goals Successfully" will take you by the hand and have you setting goals for 25 years from now. And help you figure out what you can do tomorrow to start putting yourself into a position to make your dream become a reality. "All men dream: but not equally. for they may act their dream with open eyes to make it possible." Remember I asked you before what you had done today to bring yourself closer to your goals for tomorrow? If you can't think of anything, than decide right now that reading this letter from me was your first step. Make the decision to take the advice in my guide forward with you through life. For $17.77, you can revolutionize the way you think about your future. What you invest today, you will see the rewards years from now. Months from now. And even weeks from now. 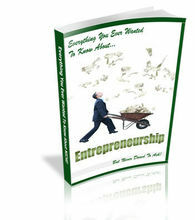 "Hot New Business: How To Plan And Build Your New Business".